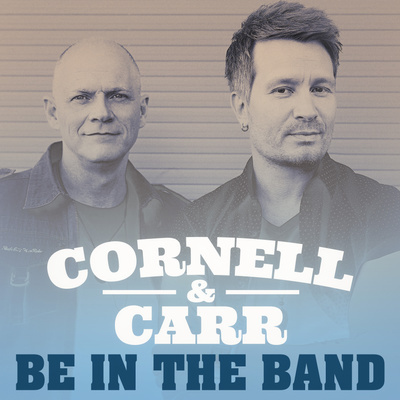 The debut single from Matt Cornell and Mike Carr, Be In The Band, is a musical celebration about chasing your dreams. It’s a song that professional musicians, aspiring artists and anyone who’s worked hard towards a dream will relate to. The upbeat anthemic feel of the track will have listeners engaged from start to finish, meaning this musical pairing is sure to have a hit on their hands with this inspirational country track. The associated video is an uplifting tribute to keeping your eyes on the prize and chasing dreams no matter what they may be, as well as a fun tribute to the close friendship Cornell & Carr share. Having both worked with the cream of Australian artists, as well as enjoying successful careers in their own right, the joining of Cornell & Carr is a stroke of genius with strong songwriting combined with magical melodies. Matt has worked as Adam Brand’s musical director for many years, for three years was a member of iconic rock band the Baby Animals, as well as a member of Richard Clapton and Shannon Noll’s bands, he has opened for many artists including Richard Marx. He was nominated for two Golden Guitar Awards in 2018, was a 2014 CMC Music Awards New Oz Artist of the Year finalist, and was a finalist again, this time for Male Artist Of The Year at the 2017 CMC Music Awards. Mike has written some of the popular country songs over the past two decades that include Adam Brand’s The Anzac and Get Loud, McAlister Kemp’s It Don’t Buy You Love, and Adam Harvey’s latest single, I’d Rather be a Highwayman. He is a two-time ARIA winner as well as a Golden Guitar winner as himself and also his hilarious alter-ego, Buddy Goode. Be In The Band is the first single lifted from their upcoming album, We Go Way Back, to be released and launched on January 25 during the Tamworth Country Music Festival.